Pope Clement VIII (24 February, 1536 –3 March, 1605), born Ippolito Aldobrandini, was Pope from 30 January, 1592 to 3 March, 1605. After the death of Pope Innocent IX (1591), another stormy conclave ensued, where a determined minority of Italian Cardinals were unwilling to be dictated to by Philip II of Spain. Cardinal Aldobrandini's election on 30 January, 1592, was received as a portent of more balanced and liberal Papal policy in European affairs. He took the non-politicised name Clement VIII. He proved to be an able Pope, with an unlimited capacity for work and a lawyer's eye for detail, and a wise statesman, the general object of whose policy was to free the Papacy from its dependence upon Spain. In 1597, he established the Congregatio de Auxiliis which was to settle the theological controversy between the Dominican Order and the Jesuits concerning the respective role of efficacious grace and free will. Although the debate tended toward a condemnation of Molinism's insistence on free will to the detriment of efficacious grace, the important influence of the Jesuit Order — among other considerations — which, beside important political and theological power in Europe, had also various missions abroad (Jesuit Reducciones in South America, missions in China, etc. ), led the Pope to abstain from an official condemnation of the Jesuits. In 1611 and again in 1625 a decree prohibited any discussion of the matter, although it was often uniformally avoided by the publication of commentaries of Thomas Aquinas. During the jubilee of 1600, three million pilgrims visited the holy places. The Synod of Brest was held 1595 in Lithuania, by which a great part of the Ruthenian clergy and people were reunited to Rome. Clement VIII presided at the conferences to determine the questions of grace and free will, controverted between the Jesuits and Dominicans, were commenced under him, but he abstained from pronouncing a decision. Clement VIII canonised Hyacinth (17 April, 1594), Julian of Cuenca (18 October, 1594), and Raymond of Peñafort (1601). 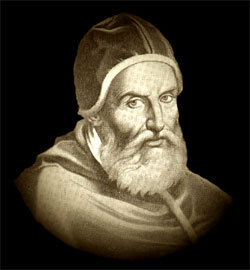 Clement VIII, given name Ippolito Aldobrandini, Roman Catholic pope from 1592 to 1605, was born at Fano, in 1535. He became a jurist and filled several important offices. In 1585 he was made a cardinal, and subsequently discharged a delicate mission to Poland with skill. His moderation and experience commended him to his fellow cardinals, and on the 30th of January 1592 he was elected pope, to succeed Pope Innocent IX. While not hostile to Philip II, Clement desired to emancipate the papacy from undue Spanish influence, and to that end cultivated closer, relations with France. In 1595 he granted absolution to Henri IV, and so removed the last objection to the acknowledgment of his legitimacy. The peace of Vervins (1598), which marked the end of Philip's opposition to Henry, was mainly the work of the pope. Clement also entertained hopes of recovering England. He corresponded with King James I and with his queen, Anne of Denmark, a convert to Catholicism. But James was only half in earnest, and, besides, dared not risk a breach with his subjects. Upon the failure of the line of Este, Clement claimed the reversion of Ferrara and reincorporated it into the States of the Church (1598). He remonstrated against the exclusion of the Jesuits from France, and obtained their readmission. But in their doctrinal controversy with the Dominicans he refrained from a decision, being unwilling to offend either party. Under Clement the publication of the revised edition of the Vulgate, begun by Pope Sixtus V, was finished; the Breviary, Missal and Pontifical received certain corrections; the Index was expanded; the Vatican library enlarged; and the Collegium Clementinum founded. Clement was an unblushing nepotist; three of his nephews he made cardinals, and to one of them gradually surrendered the control of affairs. But on the other hand among those whom he promoted to the cardinalate were such men as Baronius, Robert Bellarmine and Toledo. During this pontificate occurred the burning of Giordano Bruno for heresy; and the tragedy of the Cenci. Clement died on the 5th of March 1605, and was succeeded by Pope Leo XI.